Anti-fluoridation campaigners’ claims that community water fluoridation reduces IQ are simply false. That is the conclusion of Alex Kasprak – and he says why in his new Snopes.com article (see Fact Check -Fluor-IQ). Kasprak critiques the way anti-fluoride campaigners so often use and cite the Choi et al., (2012) study. This was a meta-analysis of 27 mostly poor quality Chinese studies from areas of endemic fluorosis where drinking water fluoride levels are much higher than that used in community water fluoridation. In other words – fluoridated water in the US has the same level of fluoride as the control or low fluoride groups in the China studies reviewed in the recent article, and the negative association with IQ was only found where fluoride levels were much higher – generally above EPA limits. Note: The optimum level of fluoridated water in the US is 0.7 mg/L. “Literally none of the studies involved tested populations of individuals exposed to drinking water that was artificially supplemented with fluoride as a public health measure. Instead, all of the studies come from China or Iran, both of which have areas of naturally occurring (endemic) high fluoride pockets of groundwater. In fact, statistical analysis of the data in one of the better papers the anti-fluoride campaigners rely on shows that fluoride can explain only about 3% of the measured variance in IQ. 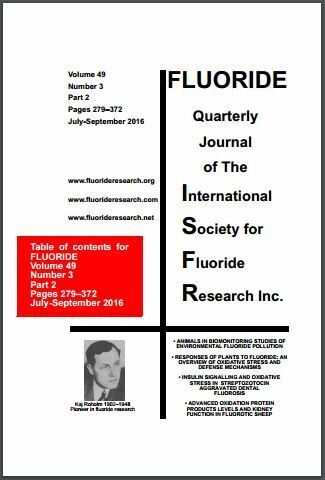 It is extremely likely that inclusion of sensible confounders in the statistical analysis would have shown any relationship of IQ with fluoride is not statistically signficant (see Connett misrepresents the fluoride and IQ data yet again). Kasprek briefly considered arsenic as a possible confounder but with subjects like cognitive ability or IQ there are many other physical and social factors that could be imnportant.contaminants. Parental income and education as well as the psychological consequences of deformities resulting from dental and skeletal fluorosis. I discussed this last aspect in my peer-reviewed article Perrott (2015), Severe dental fluorosis and cognitive deficits and my post- Severe dental fluorosis the real cause of IQ deficits? Cover of the latest issue of Fluoride. I am very much opposed to using the place of publication as an argument against the scientific veracity of a paper. True, Fluoride is a very poor quality journal. True, is has an ant-fluoride agenda. And true, it shows no evidence of proper peer review. However, it is disingenuous to use these facts to argue against the scientific content of these papers. Critique of the papers should rest on an analysis of their scientific content – not the place of publication. This lazy approach is doubly worse because it carries the implication that if these papers had been published in a reputable journal with good peer review then that would be sufficient to guarantee the veracity of the science. It is not. On the fluoride issue, there are plenty of examples of papers involving poor science that are published in reputable journals. I have discussed some of these in my articles – for example ADHD linked to elevation not fluoridation, Anti-fluoride hypothyroidism paper slammed yet again, Poor peer review – and its consequences, Does community water fluoridation reduce diabetes prevalence?, The Harvard study and the Lancet paper, Controversial IQ study hammered in The Lancet and Repeating bad science on fluoride. The lazy judgmentalism based on place of publication, and not content, is particularly relevant at the moment with the public concern about “false news” and efforts to introduce mechanisms of “fact checking.” Some people are advocating reliance on websites like Snopes.com – yet this site can be blatantly biased on political matters. And its bias can rest on the lazy approach of condemning a news article by its place of publication. However, he missed the 2016 study of Aggeborn & Öhman (perhaps it was too recent for him) which I discussed in my article Large Swedish study finds no effect of fluoride on IQ. The results of this study were so precise and the sample numbers used are so large it should be seriously considered by anyone looking at this issue. 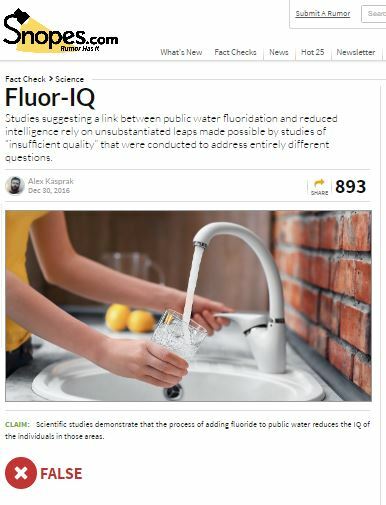 Kasprak’s article is useful in exposing the false claim of activists that fluoride lowers IQ – especially when used in arguments against community water fluoridation. But he could have said more – and he could have avoided the fallacious argument based on place of publication which is so easily reversed to support poor quality science in reputable journals.